A family run business who specialise in installing bespoke renewable energy solutions to assist our clients in reducing their carbon footprint. We combine the latest innovations in wood burning stoves and boilers, solar thermal panels and heat pumps with traditional boiler systems. This allows our clients to benefit from the lowest carbon energy options at all times, whilst maintaining the levels of convenience often required in today`s busy lifestyles. 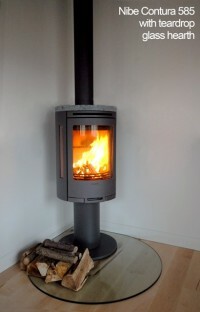 Nibe contura this shows a nibe contura 585 stove installed in the lounge of a new build house. this demonstrates a freestanding install, which is when a chimney is not used to house the flue. the flue goes through two floors and the stove is positioned on a toughened glass hearth to protect the flooring underneath. this is a contemporary stove install. 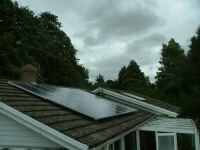 Pv panels the photograph shows a recent installtion that we carried out in the dorset area. it illustrates an on roof system, a 12 panle array, generating 2.22 kw. this is a standard installation but it is also possible to carry out an in roof installation which means the panels are level with the roof tiles. this is normally only necessary if the property is in a conservation area or it is a listed building. "we are very pleased with the system and the way you carried out the installation. i will certainly recommend you to my friends. thanks for your help." Low Carbon Energy Centre are MCS accredited engineers who undertake installations of Solar Water Heating and Solar PV. For similar installers in this area please visit the Wimborne solar page.